I’m not a happy Kansas City Royals fan. Oh, I love that they beat the Atlanta Braves last night. 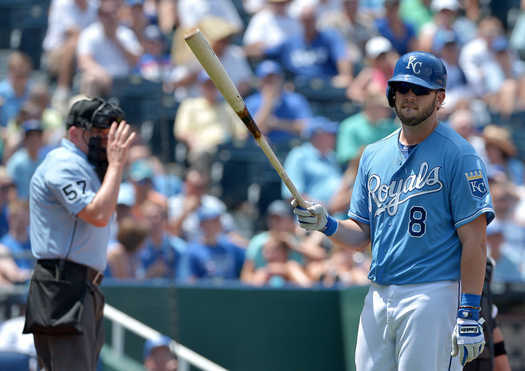 I love that Eric Hosmer and Mike Moustakas seem to be coming around. I’m definitely pleased with how the starting rotation has performed so far this season. But I cringe a bit inside every time the Royals win. Not because of the way they win, although there are games like that. No, I cringe because losing is probably the best path for this franchise if they want to move forward. 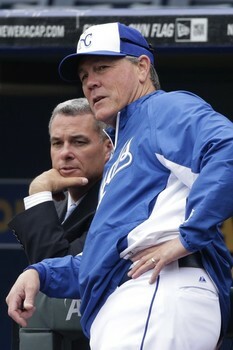 Losing means GM Dayton Moore and Manager Ned Yost will be fired and replaced. Now before the pitchforks come out, by no means do I enjoy the losing. The losing is what has gotten me to this point. The losing has spread throughout this organization for almost twenty years and has made some of baseball’s best fans bitter and angry. At the end of the day, we all want the same thing for this team–to win, to make the playoffs, and to be perennial contenders every year. But this is where some of you take a different road, and others of us take the one less traveled. Really think about what it will take to make this team a winner. I mean, really sit there and think about it. Take your time. In my mind, to have a winner at Kauffman Stadium again would mean getting rid of the management that is currently in place and has been for over seven years. It means cleaning out the manager’s office and getting rid of the guy who has occupied it for the last three plus years. It means getting rid of the seven year long process. 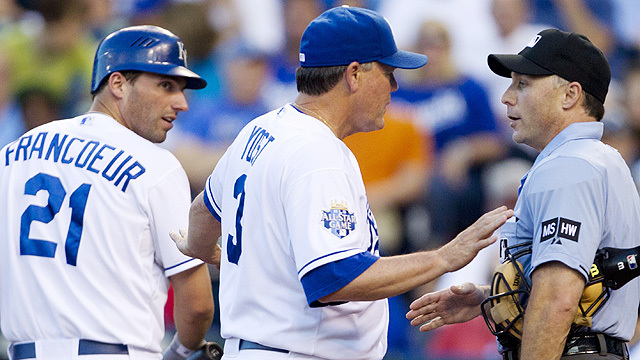 A little over seven years ago, Dayton Moore was hired to be the Kansas City Royals General Manager. He had been working in the Atlanta organization for many years and most of felt he was going to bring that winning atmosphere to Kansas City. The Braves have always been an organization that would build from within and that has had one of the best farm systems in baseball on a regular basis. It made sense that Moore knew what he was doing, as he was the assistant general manager in Atlanta. Dayton early on said all the right things; draft correctly, build from within, and add good veteran presence around these younger players. Moore referred to it as “The Process”. Moore was given a long rope, as most of us knew he was basically building this team from the ground up. We knew it wouldn’t come overnight. We knew it would take time. But as these players started trickling up the big club, more and more of them started to struggle. Last year serious questions were being asked about the minor league development of these players and why they struggled once they made it to the majors. The team had also not produced a regular starting pitcher during this time, as all the major pitching prospects either went to the bullpen or struggled in the minors. Some even became regulars on the disabled list, with pitchers like Danny Duffy and John Lamb even needing the dreaded Tommy John surgery. After seven years, we should have started seeing improvement. Instead we saw more struggles. But it wasn’t just the homegrown players that made everyone scratch their head. If the development of the homegrown talent wasn’t bad enough, the questions started to arise about the players that Moore was bringing in. For every James Shields that made sense, Dayton would bring in a Jeff Francoeur. Or a Yuniesky Betancourt. Or Chris Getz. It wasn’t always that Moore would bring these guys in; it was more about how Dayton didn’t know when to let them go. 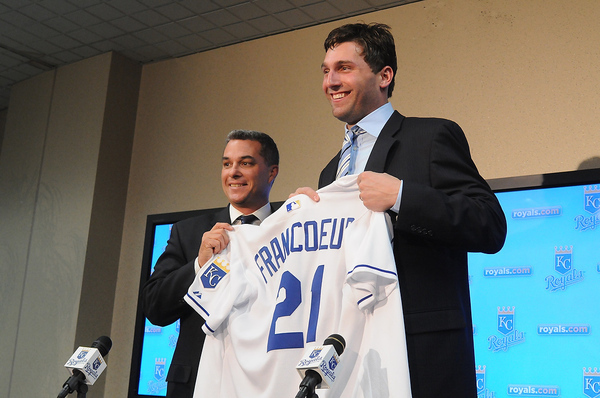 Sure, Francoeur had a solid 2011, but what has he done since then? To be honest, last week was the perfect opportunity to send Frenchy packing. Instead, Jarrod Dyson came off the DL and made it five outfielders the team now carries. All because they aren’t ready to admit that Francoeur has no value anymore. 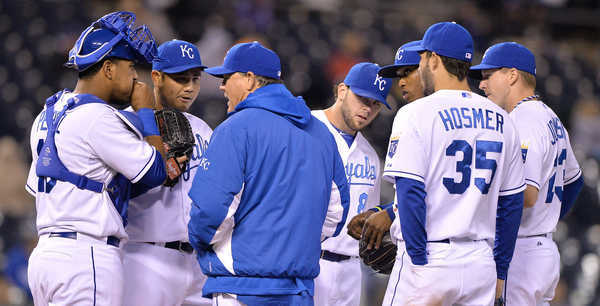 Chris Getz was sent down instead, and he is another guy that the Royals just can’t seem to give up on. Getz has never really hit, only plays average defense and more than anything just isn’t a very good major league baseball player. So when they sent him down, do they mention that he hasn’t been playing good? Nope. 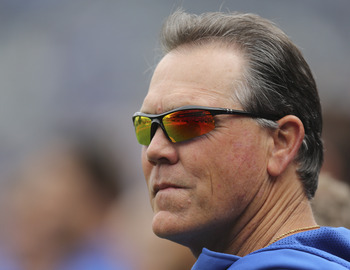 Manager Ned Yost tells everyone that Getz had options, which is why he got sent down. While I do believe him having options played into it, Getz has been the drizzling shits this year. Don’t believe me? Just look here. These are players who if on winning ball clubs would have been jettisoned a long time ago. But Moore and company still see value in them, which is a problem. This is where I remind everyone again that Moore has been in charge for seven years. So what about Yost? Well, there are normally two trains of thought when it comes to “The man known as Frank”. One is that Yost isn’t great but he isn’t as bad as some perceive him to be. Then there are people like me who think he does nothing but damage this young team. I often hear that managers don’t make nearly as much of an impact or matter as much as most people think. For a veteran ball club, I completely agree. If you have a team full of veterans, you let them go out and play and just move the pieces so you have a happy and loose clubhouse. But if you have a younger team, a manager can make or break your team. Younger players are completely new to the major league experience and aren’t always sure how to handle themselves in pressure situations. That is where a manager steps in and helps them cope with the day to day grind of a slump. It is more than just being patient, which I do think Yost is. It also about being consistent, which Yost is not. More than anything else, younger ball players need consistency. Even if it is just knowing where they are going to bat on a day to day basis, or knowing they are in the lineup every night, they need that consistency. Yost doesn’t supply it. Instead, he changes the lineup about as much as he changes his underwear(I assume that is on a daily basis; if not, I’m pretty sure I don’t want to know). One minute you are hitting 5th…the next 2nd…the next 3rd. No wonder these guys have a hard time getting comfortable! If they knew where they were batting every night, they would know before a game how to prepare and know what is going to be asked of them in that spot. Instead, they are bounced around on a regular basis and never really can get in a regular rhythm. Yost also has a bad habit of changing the offensive attack on a regular basis. One minute he wants to play small ball and asks his players to bunt a lot. Then he wants them to hit for power. Then he wants them to bunt again. I feel like we should call him Cybill instead of Neddy(or Frank). Bottom line, there is no consistency. I feel like a broken record, but it always comes back to this. This team deserves a better person to learn from. I’ve felt for awhile that this team isn’t a team that can contend and that the Shields trade didn’t get them as close to the playoffs as they thought. If that is the case, then management basically gave away 6 years of controlling Wil Myers for 2 years of Shields with just an outside shot at the playoffs. After seven and three years respectively, less than a winning team at this point is just not acceptable. Moore continues to hold onto players that hold down the team(Francoeur, Getz, Hochevar, Chen) while Yost can’t decide on a lineup and has lost any idea of what strategy he wants to take anymore. Just this past week, Yost changed the lineup for the umpteen bajillionth time, moving slumping Alcides Escobar back into the number two slot in the lineup. Nevermind that Eric Hosmer had started to really hit out of that spot. Nevermind that Escobar has not offensively been the player he was in 2012. Nevermind that Salvador Perez had been slaying the ball in the 3rd spot. Nope, need to change the lineup again. The worst part is that Yost has gone back to focusing on bunting, which I assume is why Esky is back batting 2nd. They even did bunting drills before the game yesterday. Yes, in 2013 they still want to emphasize bunting. At this point, Yost has no clue how to get this team going and is just going back to the only thing he knows. He has no new ideas. 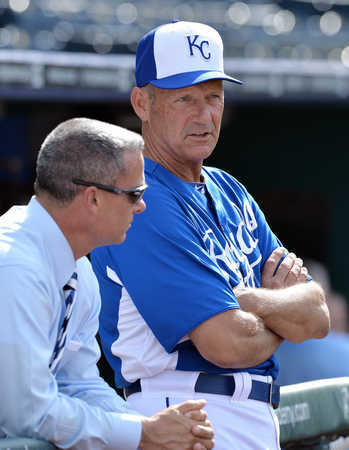 Hiring George Brett was a Hail Mary pass that only landed out of frustration. Management is out of good ideas and is just going to let this team go out there and do whatever comes about. So why do I want this team to lose? Because at this point, the only way to truly make change is for Moore and Yost to get fired and bring in completely new management. New minds, fresh ideas and hopefully someone who doesn’t think Jeff Francoeur is a good ball player. 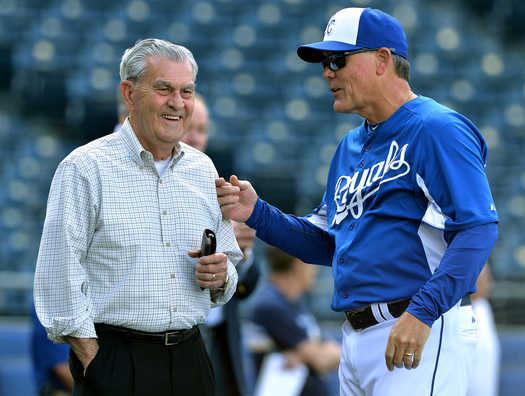 What the Kansas City Royals need is for the team to embarrass Owner David Glass and force his hand. I don’t want to be the guy who prefers his team to lose. God knows in a lot of ways it kills me. But I also know that is the only way change will occur. If they win and finish over .500, I firmly believe we are looking at another two to three more years(at least) of Moore and Yost. Now ask yourself: Can you stand two to three more years of this? I can’t. So I’m going to hope they lose. If there ever was a time to ‘take one for the team’, this is it. Losing this year is the best path for a brighter future in Kansas City. I can’t be alone on this thinking.